With confident voice; concise and powerful lines, and a keen mind, the writings of David Thomas toil in the places where many contemporary American writers aren't skilled or experienced enough to venture. Thomas excavates the foundations for his writing where the nature writer and working class poet overlap. He fixes hard earned observations upon person or place, event or season, and applies his honed craft, staying until the job is well done. With his latest collection, Waterworks Hill, we find a truly powerful sampling of one of America's premier writers. His mind picks up sandy WPA bricks, bleak boxcars, or Murphy's Lounge and builds them anew. Whether riding the Ecuadorian Railway or passing through the snowy mist in Hellgate Canyon, his vision is wide, encompassing, and invites us all to come along. Thomas watches where wind and water write on stone. See for yourself. Dave Thomas, like his old visual artist friend, the late Jay Rummel, is a Montana original, a gift from the Hi-line to us refugees down in Missoula. His poems create intimacy with all things without being sentimental. He's in love with the grime and sweat of work done out doors amidst the beauty of rivers and a small pine growing in the shade, or being stuck at the dump; his sense of social justice is pricked by his travels into Latin America; his respect of and honor for his parents and family are the expression of the true rebel; his grief for lost friends and lovers contains the "silence / of chokecherries/ and talus." 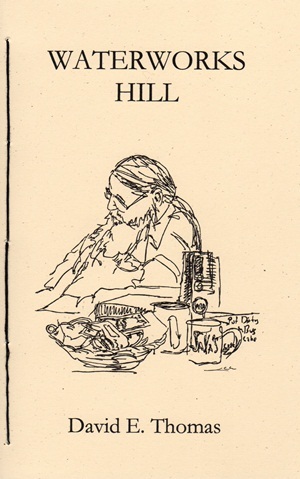 He easily reminds us of an older, truer Montana alive in these sure-footed, hard-earned poems. It's Saturday, and he's not on anybody's clock. He'll take you there." Dave Thomas invites you to lace up your boots, clean your glasses, and walk with him. Don't miss this opportunity. You'll work, drink, travel, and mourn-observe and celebrate the “moments” in life. He is the blue-collared Zen master of the clear-eyed spare-form. Dave's simple poems are simply as good as poetry gets. They chronicle the daily joys and mysteries of this brief trip we're all on. Waterworks Hill is the chronicle of a man who is simply walking around with a camera obscura in his gut, the anxious trampling / of buffalo in his heart / of time murmurs secrets / in unknown ears, having learned the lessons taught from the moon. David E. Thomas grew up on the Hi-Line in North-central Montana. He graduated from the University of Montana then found himself on the streets of San Francisco where he began his literary education. Economic realities drove him to work on railroad gangs, big construction projects like Libby Dam and other labor intensive jobs. He has traveled in the United States, Mexico and Central America. He has published three books of poems, Fossil Fuel, Buck's Last Wreck and The Hellgate Wind and has poems in the anthologies The Last Best Place and Poems Across The Big Sky and most recently New Poets of the American West. He currently lives in Missoula, Montana.